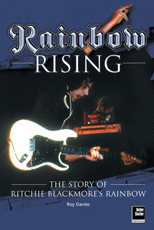 Guitar legend Blackmore quit Deep Purple in 1975 to form Rainbow. Hit albums like Rising and Long Live Rock'n'Roll, singles like 'All Night Long' and 'Since You've Been Gone', and legendary live shows put them at the top of rock's premier league while Blackmore's legendary bad temper helped maintain a high press profile. Rainbow Rising will appeal to fans of Deep Purple, Whitesnake, Black Sabbath and hard rock in general, as well as the legions of fans of virtuoso guitar playing.